Now, locate the 'Next Event' lab and click 'Enable.' 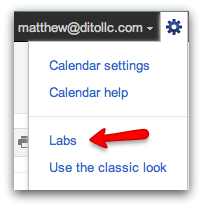 Remember to always click 'Save' at the bottom or top if the list to ensure the lab is turned on. 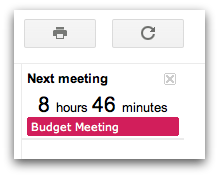 Once the lab has been turned on, you will notice the new feature in the upper right hand corner of the calendar interface. The 'Next Event' lab will show you the time remaining until your next event begins. Now, you'll never miss the 'Next Event' on your calendar! Note that this lab will only feature events that are on you main (default) calendar. Please let us know if there are other labs in Calendar or Mail that you would like to see featured on our blog in the comments section below.